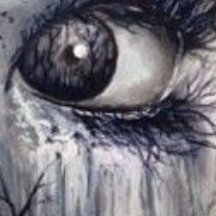 Classic, mysterious, stimulating: in this series I want the viewer eyes to be engaged on a variety of levels. Scheduled for this event: a Low Key-Setting – at least in the beginning. You might remember that I already designed a 4-Point-Beauty-Lighting the last time. However, this time all my focus and attention is dedicated to shadows, curves and accents. According to the nature of this idea, I am shooting this one in front of a black background. but this time my exercise is to establish accent lighting step-by-step with the goal of a balanced finished result featuring four lights. However, the outcome of each single step (lights 1 to 3) itself can be used as an individual final result with an independent look and feel. So I am testing rim lighting, accent lighting, catch lighting – starting out in a low key situation. I am thrilled to once again having the fantastic chance to work with my good friend, the former Czech Playmate Dasa. Obviously, the beautiful Dasa draws in our gaze first but on top of that, there is a heightened sense of mood achieved through the dramatic lighting. The satiny glow of her skin set against the severe geometry of her revealing shirt is a dynamic juxtaposition that keeps our sight line fluid and moving. The play of light and shadow is in the beginning intense, with deep contrast between soft highlights and dark areas. Dasa’s postures are emphasized by the stark lighting gradient, which creates a mysterious and alluring effect. Placed against a black background and standing in profile, one is filled with visions of an actress on stage about to recite – especially in the black and white converted images. 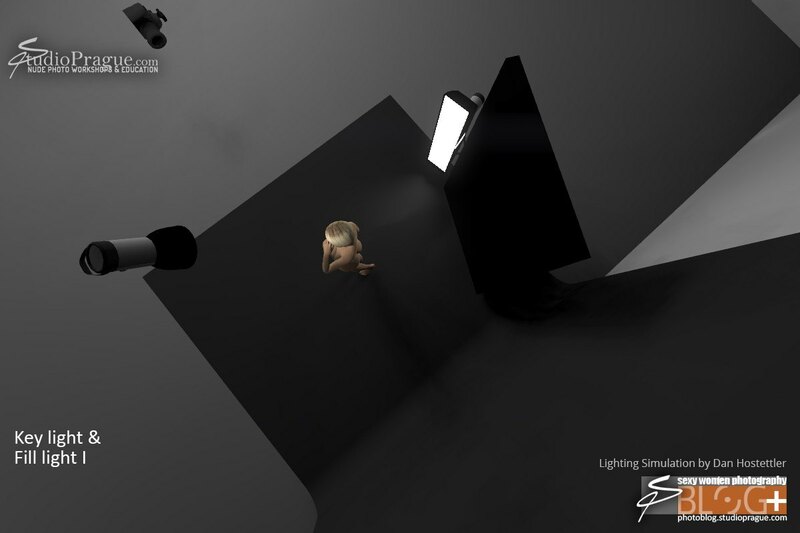 To implement my concept, I have to play with several light modifiers. 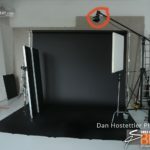 As you know, the modifiers (light shapers) for light sculpting are much more important than the strobe-heads themselves. Right now I don’t have all light modifiers for one system at hand, so I have to mix my own lighting-equipment with studio equipment. My plan is to use a mix of standard reflectors, strips, a beauty dish and grids. Yet some of these modifiers are available for a specific system only. So I go ahead and mix the two flash-head systems in order to get my desired modifiers operational. Finally, I work with a Profoto pack & head system (ProB) and my own Multiblitz monoblocs (portable monolight- heads). Using a standard reflector with grid (honeycomb) for setting the prevailing mood of the shoot. Using a strip-softbox for rim lighting and accentuating the body’s shape. 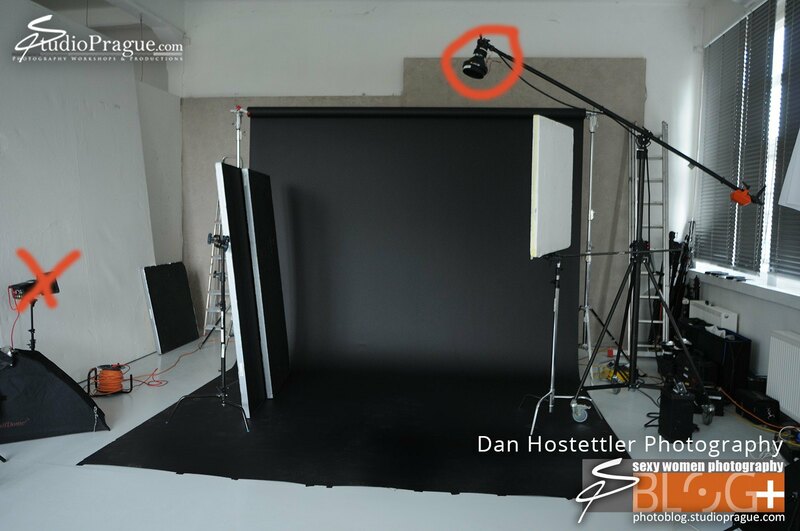 A beauty dish with grid is creating a more dominant fill and more importantly: catch lights. A snoot (spot modifier) with grid pops creates a more accentuated and atmospheric visual background-structure. Basically, I like the color images as shown here a lot. 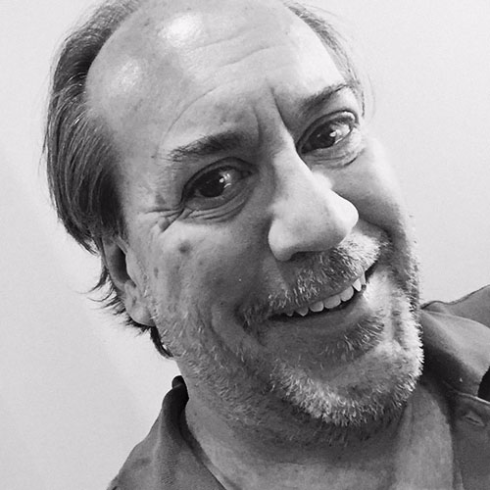 But to get a better idea about an artistic touch – especially for the photos with one or two lights only – I also converted the results into black and white. 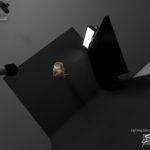 This inexpensive program provides you with everything you need and enables you to create and read lighting setups in no time! 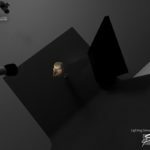 set.a.light 3D STUDIO is available in English and German language. I am a very big fan of it! And what’s more, this is the one and only piece in existence that concentrates on setting and calculating lights while it has nothing to do with 3D creation (!). It’s all about supporting you in designing your light sets. After the expiration of your trial download, you will still be able to use the viewer. This way you can keep on seeing my lighting plans for free as I will make them available for you here. 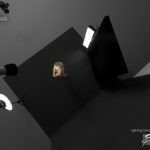 This article on four point lighting is really good to understand if anyone is going to use this setup in the future. What I would like to recommend as weekly or monthly exercise, where the reader can test their knowledge of what was used in the photograph. The type of light etc etc as above in the tech sheet / lighting diagram. I feel this is a way a photographer can learn about set lighting and camera exposure. So after the weekly or monthly edition, you can let us know how it was done. The lucky winner will have their name in lights! !…sorry for the pun. What say you Mr Hostettler? Looking forward to many more and take care. I have found after taking this set of blog classes that I do look at pictures differently. I see where the lights are placed, how the dramatic lighting was created or the complete lack of drama for product shots. It has been very educational to read what you say, look at the diagrams you have, see where and what kind of lights were used and apply that to my own work (as few and far between as it is lately). I find it also very helpful that you say what equipment you are using. I am trying to build enough revenue to buy more equipment for a more diverse portfolio of work. Now, it is basics: composition with existing light or a basic fill light. Loved the course and the knowledge that you have amassed over your career that you are sharing. thanks for your comment and I’m happy you can apply some ideas and tips to your actual photography! Regarding my equipment: I just have a few posts in pipeline giving insights about my camera gear and my portable lighting equipment (incl. all the light modifiers). This will start after Eastern and you will get it with the regularly Saturday email-hint. Great you get so many different info here! Good luck on your photography journey and any comments and ideas here on BLOG+ are very appreciated. glad you find it helpful! And thanks for the idea regarding “how was it done”. I am actually planning much more interactions in form of a forum – but this will take a while until it’s up and running. I probably just can implement a sub-page with a better “commentary”-function and we can establish kinda ongoing bi-monthly thing… – let me think about. Great idea, thanks! Very nice images Dan. I was actually thinking about something like this for an upcoming shoot. What did you meter the individual lights at? I’m trying to get an idea of the relative strengths of the key and fills.